And here I have another 10 things to say. Hmm. . . I'm so passionately drawn to those who've been through or going through a heartbreak. Could it be because I've been there too? It is usually general for certain things to happen to us in life. There will be happy days and there will be gloomy days. In the gloomy days, there will be heartbreak, hurt, tears, pain. These are days when we don't feel any special or find any inspiration. When we allow these negative events to define who we are, we'll see the world in a negative light. And we don't want any form of negativity around us. Do we? 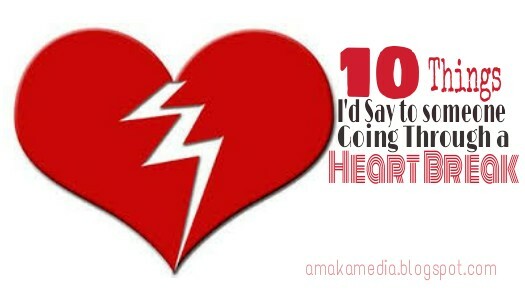 Here are 10 things I'd love to tell anyone going through a Heartbreak. . .
1. Do not regret the experience. Look deeply to find the beauty and the lesson of the pain. 2. Be careful who you share your painful story with. Put your dignity and integrity in check. 3. Take things one day at a time. Try not to look too far into the future. Slowly, steadily work through each day. 4. Manage your money. Don't go on a shopping spree to get over the ache. It will do you no good. Save for rainy days. 5. Take care of yourself. Eat healthy food. Don't forget to smile. It looks like the world has ended, but each day is still a gift. 6. Create your own world. Make it a happy one. Take charge of your emotions. 7. Appreciate the people who love, support, and help you. They are trying the best they can to share in your pain. 8. Leave your ex in the past. A part of you would love to check his/her pictures on social media, but move on. Stop double-clicking on your past. Move on. 9. Bless someone. The best time to be a blessing is when you are heartbroken. Our burdens feel lighter when we help another. 10. Forgive the one who hurt you. Forgiveness brings you the healing you need. It unlocks you from the prison of your past and sets you free. Heart break can be a blessing in disguise. You know what is better than being in a relationship with someone and loving them? It is being in a relationship with yourself and loving you as God does. Plus, knowing exactly what you want and what you don't want in a future relationship.